From neighborhood handymen to freelance computer programmers, Americans have long taken on piecemeal work in lieu of (or in addition to) traditional salaried employment. But today a variety of apps and online platforms are making it easier than ever for people to connect with customers who might like to hire them to do any number of jobs – from performing various types of online tasks to driving for ride-hailing services or cleaning someone’s home. These platforms also allow users to earn money in a range of other ways, such as sharing their possessions with others or selling their used goods or personal creations. Proponents of these digital earning platforms argue that they offer important benefits, such as the freedom and flexibility to work at a time and place of one’s choosing or the ability to turn a hobby or pastime into a source of income. But others worry that this emerging “gig economy” represents a troubling shift in which workers face increased financial instability and are required to shoulder more of the burden for ensuring their own pay and benefits. Against this backdrop, a new Pew Research Center survey of U.S. adults finds that a relatively substantial share of the public has earned money recently from a digital commerce platform. 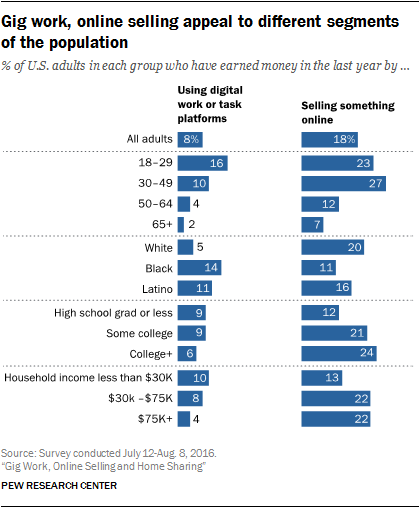 In the context of gig employment, nearly one-in-ten Americans (8%) have earned money in the last year using digital platforms to take on a job or task. Meanwhile, nearly one-in-five Americans (18%) have earned money in the last year by selling something online, while 1% have rented out their properties on a home-sharing site. Adding up everyone who has performed at least one of these three activities, some 24% of American adults have earned money in the “platform economy” over the last year. Beyond these overall figures, the survey also illustrates the wide variety of experiences among providers in the platform economy. At one end of the spectrum are casual users who perform mostly online tasks in their spare time. These users tend to take on these jobs for modest amounts of money. 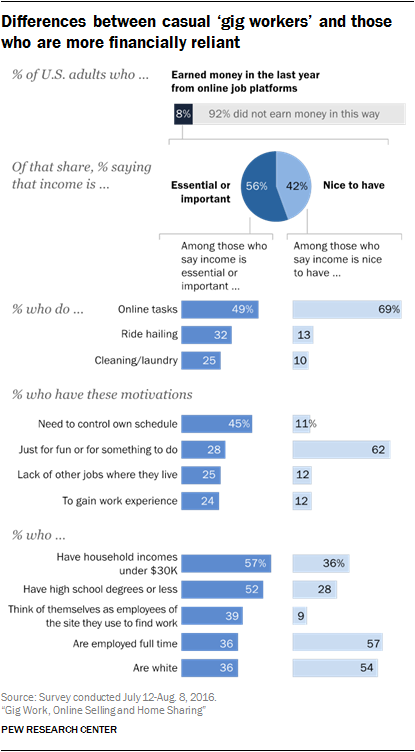 In fact, many describe their main motivation as simply passing the time and say the actual income they earn is not particularly essential to them. At the other end are dedicated users who rely on the income they earn from these digital platforms to a much greater extent; who are more likely to gravitate towards physical tasks; and whose usage of these platforms is motivated largely by financial considerations or the need to find work that can fit around the other demands on their time, such as schooling or child care. 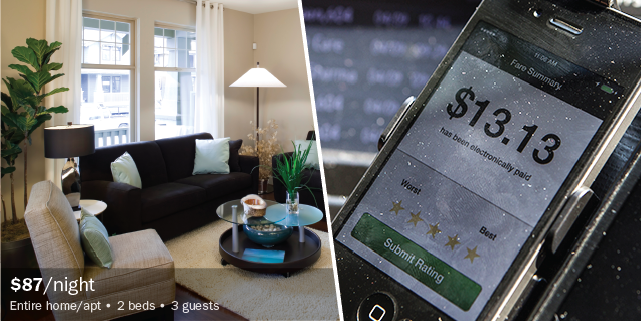 These survey findings highlight several key themes related to the emerging platform economy. First, they illustrate the wide diversity of ways in which Americans are earning money from various digital commerce platforms. In the case of gig work, 5% of Americans indicate that they have earned money from a job platform in the last year by doing online tasks – which might include anything from IT work to taking surveys or doing data entry. Some 2% of Americans have earned money by driving for ride-hailing services, while 1% each have used these platforms to perform shopping or delivery tasks, as well as cleaning or laundry tasks (an additional 2% have done a wide variety of tasks that fall outside of these four general groupings). Online selling is similarly wide-ranging. The largest share of online sellers are using digital platforms to sell their own used or second-hand goods, but others use these sites to sell a wide range of handmade items and consumer goods. Second, this survey finds pronounced differences between Americans who earn money from labor platforms where users contribute their time and effort, versus those who earn money from capital platforms where they contribute their goods or possessions. Participation in labor platforms, for example, is more common among blacks and Latinos than among whites, more common among those with relatively low household incomes than those with relatively high household incomes, and more common among young adults than any other age group. But when it comes to capital platforms such as online selling, the reverse is true: Online selling is more prevalent among whites than blacks, more common among the well-off and well-educated than those with lower levels of income and educational attainment, and is engaged in by a relatively broad range of age groups. Along with these demographic differences, users of labor platforms and capital platforms express different levels of reliance on the income they earn from these sites. Some 60% of labor platform users say that the money they earn from these sites is “essential” or “important” to their overall financial situations, but just one-in-five online sellers (20%) describe the money that they earn in similar terms. Third, along with these differences across labor and capital platforms the survey finds differences within these platforms as well – specifically, between those who depend heavily on the money they earn from these sites and those who describe their income as merely “nice to have.” In the case of gig work, workers who describe the income they earn from these platforms as “essential” or “important” are more likely to come from low-income households, to be non-white and to have not attended college. They are less likely to perform online tasks for pay, but more likely to gravitate towards physical tasks such as ride-hailing or cleaning and laundry. They are also significantly more likely to say that they are motivated to do this sort of work because they need to be able to control their own schedule or because there are not many other jobs available to them where they live. Fourth, the survey finds that the broader public has decidedly mixed views about jobs in the emerging gig economy. On one hand, a majority of Americans feel that these jobs are good options for people who want a flexible work schedule (68%) or for older adults who don’t want to work full time any more (54%). On the other hand, around one-in-five feel that these jobs place too much financial burden on workers (21%) and let companies take advantage of workers (23%), while just 16% feel that this type of work offers jobs that people can build careers out of. 23% of those who utilize digital “gig” platforms for work are students; a majority describe themselves as being employed either full (44%) or part time (24%), but 32% say they are not employed. One-in-five online sellers (19%) say that social media is extremely important to helping them sell their wares; women who sell online are more likely than men to say that they rely on social media. 26% of gig platform users consider themselves to be employees of the services they use to find work; 68% view themselves as independent contractors. 29% of gig workers have performed work using these sites for which they did not receive payment. This report is part of an ongoing series of Pew Research Center studies examining the new digital economy and the future of work more broadly. Previous reports in this series have examined the shifting economic landscape of work and employment, the use and adoption of a variety of sharing economy services, and the tasks and workers that make up the Mechanical Turk marketplace.